A shared vocabulary is a vital component of effecting discussion and collaboration, so we begin with a brief background to STEM/STEAM, “making”, makerspaces and the maker movement. With this background we explore the power of integrated making and creating in providing valuable opportunities for students to problem-solve, design, create, build resilience, tinker and innovate. These opportunities help our students to learn real skills that support their learning, from the ability to plan, build and use something concrete to the ability to collaborate, compromise, fail, keep on trying and succeed. We explain how integration can help us as teachers to take STEAM and making and make it an embedded, relevant and manageable element of the broader curriculum so that, instead of being another "add-on" it is a meaningful enhancement. 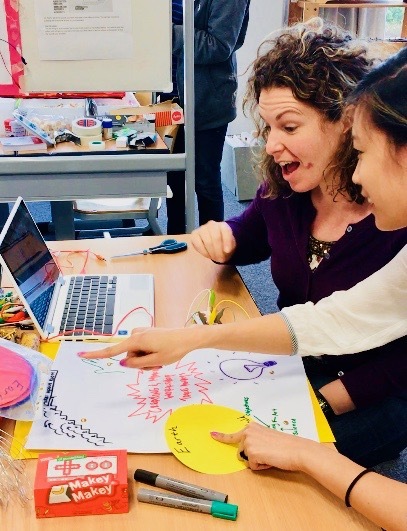 In this practical, hands-on STEAM session you will gain experience and build capacity working with a variety of STEAM tools on with a focus on identifying, developing and reflecting on maker attributes, attitudes and the student experience. Part of being successful in integrating STEAM in the wider curriculum involves having an awareness of the core curriculum areas, units and topics where STEAM integrates most naturally. We will introduce and explore examples and ideas for STEAM integration across the curriculum and provide an opportunity for you to share, discuss and reflect on existing STEAM practices in your own context. Maths and science, in particular, lend themselves very well to STEAM integration (after all, they are the S and M in STEAM!). To help you to take the information and ideas we have covered so far and help you to turn them into practice, in this session you will have the opportunity to participate in several activities using a variety of STEAM tools. Each activity is explicitly connected to a maths or science curriculum objective that can be easily differentiated up or down by age or ability, to help you to identify how a similar approach could be taken in your own class and inspire you to think of STEAM integration ideas of your own. For our students to be successful in learning engagements they need support and guidance from us in the form of effective planning and scaffolding. In this session we will help you to identify necessary prior student knowledge and skills for STEAM integration and provide you with practical tools and approaches for planning and scaffolding for success in STEAM. There are many ways that STEAM can be used to enhance student learning in language, social studies and the arts. In this session we will once again support you to use a variety of digital and non-digital tools in context to experience how STEAM can be integrated into these areas, giving you practical experience, support and ideas that you can use as inspiration or apply in your own class and context. Now that you have the knowledge, understanding and skills to confidently begin to integrate STEAM in your own class or school, in this session you will have the time and our support to make short and medium-term plans for how you can take this learning and implement it meaningfully when you return to school. We like to finish this workshop on a high, and in this last session you will have one more hands-on opportunity to use the tools and skills you have been working with over the past two days in a fun, challenging and motivating task that will leave you feeling confident, competent and excited about STEAM integration in the classroom.